FILE - A woman walks past an Ethio Telecom office in Ethiopia's capital, Addis Ababa, Nov. 9, 2015. Amid reports of violent clashes that have led to at least 15 deaths, the Ethiopian government has partially blocked internet access to its citizens, suppressing information about the exact scope of the violence and the response of federal security forces. ​Ethiopians have been unable to reliably reach Twitter and Facebook since Tuesday, and other services may also be affected. Restricting internet access is a common tactic for the government when protests break out and security forces crack down. The government has justified such action in the past as a response to unverified reports and rumors, noting that social media become flooded with unconfirmed claims and misinformation when violence erupts. But blocking internet access also makes it more difficult for citizens to assemble peacefully or monitor what’s happening on the ground. Unlike most nations, which have multiple internet service providers (ISPs), Ethiopia’s sole ISP, Ethio Telecom, has almost full control over internet access in the country. To block traffic to and from certain websites, or even shut down access altogether, the government needs only to coordinate with Ethio Telecom, a state-owned company. In contrast, it would require the cooperation of more than 2,600 ISPs to shut down internet access in the United States. Ethiopia is one of 61 countries with only one or two ISPs, according to a 2012 report by Dyn, a company focused on internet traffic and data management. Countries with few ISPs face the severe risk of an internet disconnection, according to Dyn, because these providers often are state-owned, making it easy for repressive governments to control and monitor access. But even when a government shuts down the internet, information can trickle in and out of a country via dial-up connections on international phone lines and satellite links. 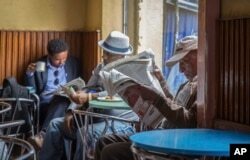 FILE - In this Oct. 10, 2016, photo, Ethiopian men read newspapers and drink coffee at a cafe during a declared state of emergency in Addis Ababa, Ethiopia. Since 2015 there have been wide-ranging internet shutdowns. ​In the case of a partial shutdown in which a government blocks access to certain websites and services, citizens can still gain access to blocked content via proxies and virtual private networks (VPNs). These tools use encrypted intermediary connections to acquire access to blocked sites. Rather than connect to Twitter directly, for example, a citizen would connect to a server that’s still accessible and then request the blocked content. The Addis Standard, an English-language website with extensive coverage critical of the government, has servers in Orlando, Florida, enabling it to stay active, even in the midst of crackdowns. The Ethiopian government has given itself legal authority to maintain its technological monopoly. In 2012, the government issued a proclamation outlawing the formation of any new ISPs or bypassing of any existing communications infrastructures. That keeps control in the hands of Ethio Telecom, now the largest telecom operator in Africa, according to its website. “Ethio Telecom is the sole provider of telephone services and internet in Ethiopia, and it is traditionally seen as a government cash cow,” said Mohammed Ademo, a freelance journalist and the founder and editor of Opride.com, a news site that highlights opposition voices. That gives the government a financial incentive to prevent privatization, in addition to the political power it can wield with full control over the country’s communications infrastructure. Some observers have questioned whether government efforts to control information accomplish their intended purpose. Soleyana S. Gebremichael is a human rights advocate and former lawyer. When protests broke out across Ethiopia in the summer of 2016, she raised doubts about the effectiveness of a 48-hour outage. “With or without the internet, people already had the urgency of going out to protest and then presenting their question and petitioning the government,” Gebremichael said. Partial or full internet blackouts in Ethiopia have become routine in recent years, and outages don’t coincide only with unrest. Earlier this year, the government restricted mobile internet access during a national exam period to discourage cheating. Analysts say the government employs a range of tactics to stifle dissent with technology, including the use of electronic surveillance to spy on dissidents, journalists and other perceived enemies. Earlier this month, a Canadian research group concluded that agencies in the Ethiopian government monitored dozens of people around the world with sophisticated spyware that provides full access to remote computers. Last year, a joint report by the Open Observatory of Network Interference and Amnesty International concluded that the Ethiopian government was deploying Deep Packet Inspection technology, a powerful tool that facilitates mass surveillance and censorship.